Excerpted from Reinventing The Chicken Coop (c) Kevin Mcelroy & Matthew Wolpe. Photograpy by (c) Erin Kunkel. Used with permission of Storey Publishing. 1 of 8 Excerpted from Reinventing The Chicken Coop (c) Kevin Mcelroy & Matthew Wolpe. Photograpy by (c) Erin Kunkel. Used with permission of Storey Publishing. DIY lovers can build this coop at home with McElroy and Wolpe’s “.” It nods back to the era of midcentury Modernism with its inverted butterfly roof. 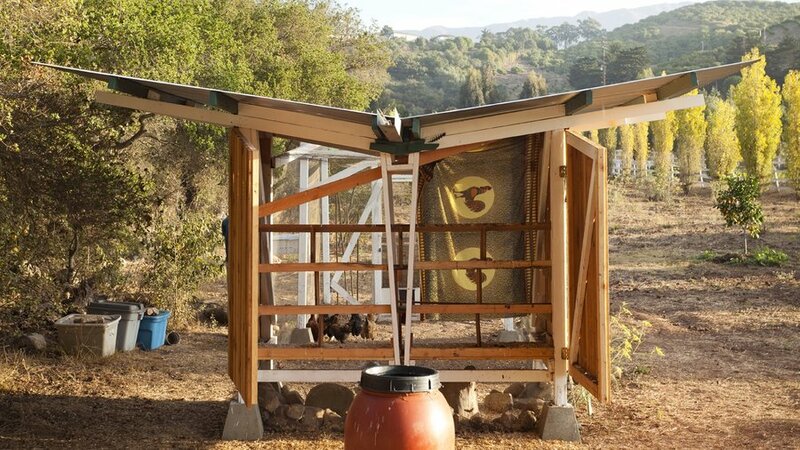 The water-wise design funnels rainwater directly from the roof to the chickens. 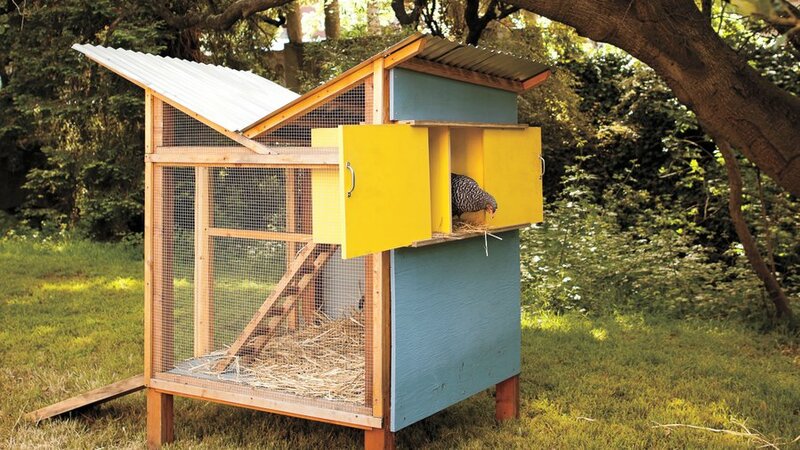 The hens can dwell in a cabinet-like nesting nook and climb up and down the two levels with an adorably petite ladder. 2 of 8 Excerpted from Reinventing The Chicken Coop (c) Kevin Mcelroy & Matthew Wolpe. Photograpy by (c) Erin Kunkel. Used with permission of Storey Publishing. For all the homesteaders who adore treehouses, this coop is for you. Built with a spiral staircase, McElroy and Wolpe framed the high-rise around a 4x4 post sunk into concrete. Framed by mini-doors and glass sides, the lifted house offers a clear view into the roosting quarters. Excerpted from Reinventing The Chicken Coop (c)Kevin Mcelroy & Matthew Wolpe. Photograpy by (c) Erin Kunkel. Used with permission of Storey Publishing. 3 of 8 Excerpted from Reinventing The Chicken Coop (c)Kevin Mcelroy & Matthew Wolpe. Photograpy by (c) Erin Kunkel. Used with permission of Storey Publishing. This small-space mobile coop is perfect for urban homesteaders. 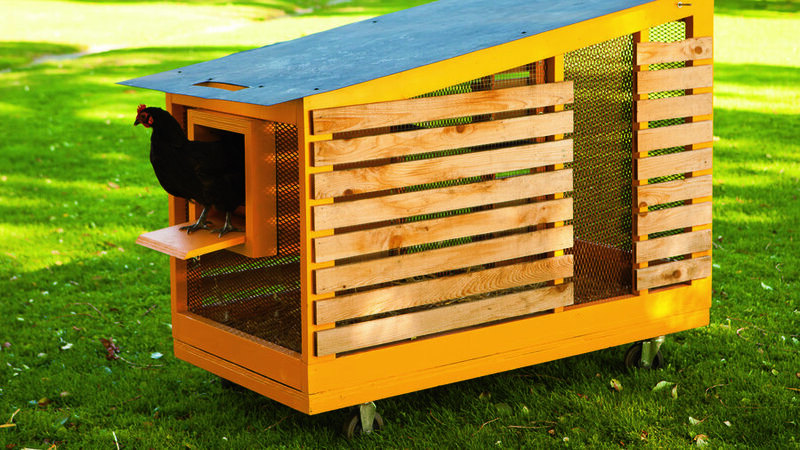 Designed by Nicole Starnes Taylor of Make Design Studio, The Tractor fits up to three chickens. 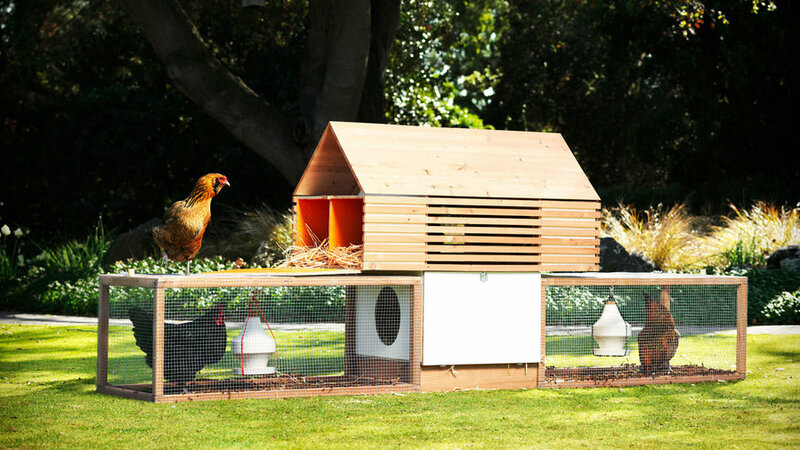 Backyard gardeners with generous grounds will enjoy rolling the coop from plot to plot, ensuring each crop gets even fertilization and soil aeration. 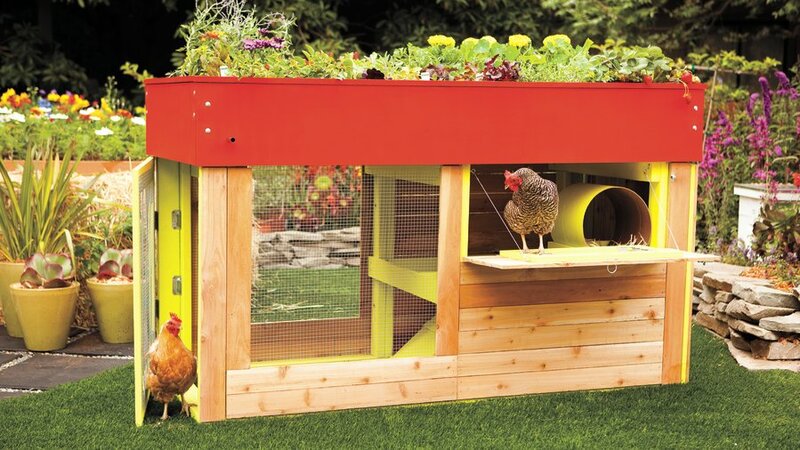 Ideal for small-space edible growers, Traci Fontyn of Seattle designed this coop to merge her two loves. This unit doubles as a home for hens and a garden bed for edibles with shallow roots. The Kippen’s simple rectangular structure gives birds two exit points and a barrel-shaped roosting bar. 5 of 8 Excerpted from Reinventing The Chicken Coop (c)Kevin Mcelroy & Matthew Wolpe. Photograpy by (c) Erin Kunkel. Used with permission of Storey Publishing. There’s few better way to reuse wooden pallets than creating a rustic chicken coop. McElroy and Wolpe constructed this DIY project for author and Oakland urban farmer Novella Carpenter. 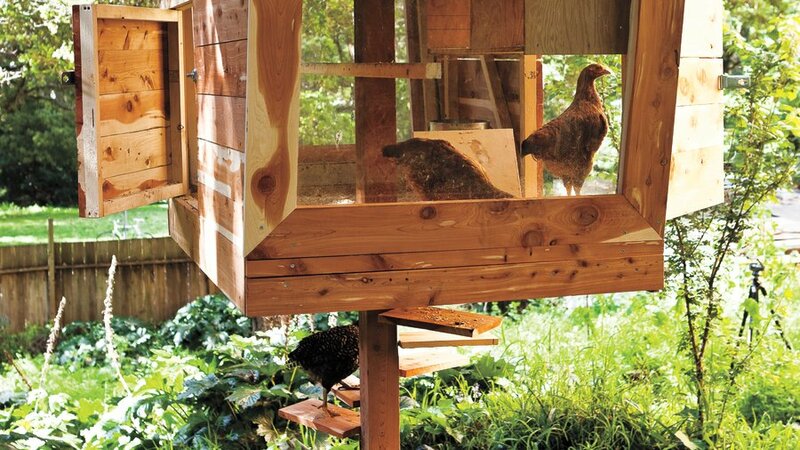 Sizing up to 100 square-feet, this spacious coop hosts a cantilevered roosting area just above the dry storage. 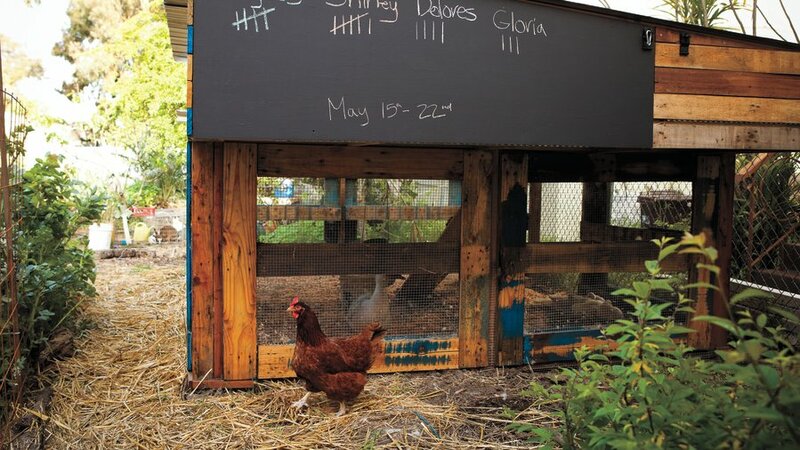 The countrified structure even has a fun chalkboard panel to tally up weekly egg counts. Oakland locals Rusty Lamer and Andreas Stavropoulos designed this ingenious DIY coop for small, urban plots. The 5x3 1/2 A-frame houses up to four hens and comes with a latch-able entry, easy-open egg door, and an interior roof for rainy day coverage. The unit’s roosting area fits two to three hens and comes with built-in handles for pain-free lifting. The Moop brings a sleek, minimalist look to backyard chicken keeping. The two-level unit features dual entry slats on both ends of the slender foundation. The base unit hosts custom ceramic feeders and a first-level nook for hanging out. Backyard birds can climb up to the second level and roost in the cantilevered nesting boxes. Bay Area designers Peter Strzebniok and Deborah Wong even added a quaint attic space for tools and feed storage. Designed for Santa Barbara’s warm climate, Alex Wyndham’s Chicken House bares a bird-like roof that’s both stylish and drought-friendly. The 4x8 foot unit is capped with a corrugated steel roof that extends approximately three feet on all sides, funneling rainwater into an adjacent barrel. Incredibly functional, the backside opens up completely, simplifying egg collection and chicken care. The Toro Canyon coop can hold up to 40 chickens, but currently houses less than 20.